OK, so you didn't see Michael Heizer's Levitated Mass making its King Kong–style caravan across town to LACMA on the back of a flatbed. And maybe you blinked and missed NASA's retired Space Shuttle Endeavour catching a ride above LA on the back of a Boeing 747 last month. Well, you still have a chance this weekend to be a part of the spectacle that the LA Times' architecture critic Christopher Hawthorne recently compared to the parades of ancient Rome. In its ten years of service, the Endeavour completed 25 missions, spent 299 days in orbit and orbited the Earth 4,671 times while traveling 122, 883, 151 miles. 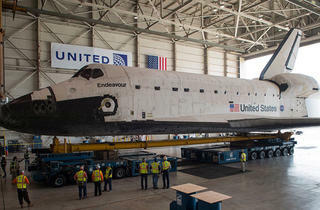 This Friday, it will make its last journey: a 12-mile, two-day trip from LAX to its new retirement home at the California Science Center. (A cinch, compared to orbiting Earth and all that.) "Mission 26" begins before dawn at LAX, where the shuttle will be loaded onto a modified NASA transporter to begin the first leg of its vision quest down Westchester Boulevard to Sepulveda Boulevard, hang a left on Manchester Avenue. Security will be tight, but if you get close just watch out for that 78-foot wingspan (Endeavour's always knocking stuff off the table with those things). On Saturday, around 8 am, it'll pass by Inglewood City Hall, and then on to the Forum for a pit stop and welcoming ceremony at 9 am. Next it heads to the intersections of Crenshaw and Martin Luther King, Jr. Boulevards, where more than 200 dancers, drummers and aerialists keep the party going. 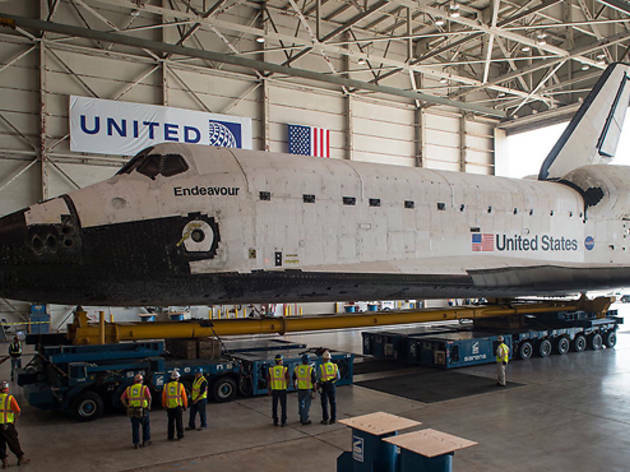 At around 9 pm Saturday night, Endeavour will pull into its new home, the California Science Center in Expo Park, where it will probably sit around and get fat from drinking beer and talking about its glory days. For more information about Endeavour’s journey, to sign up to be a volunteer along the route and to reserve tickets for exhibition that opens on Oct 30, visit the California Science Center’s website.